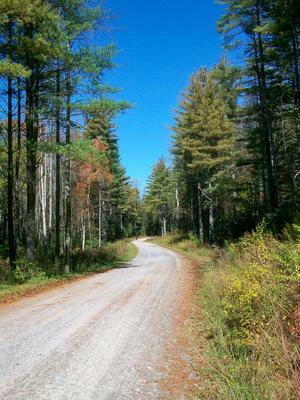 This is a wide, graded, maintained gravel road, which is gated but occasionally used by park vehicles, and private vehicles for visiting the waterfalls (by permit). Passes the old airstrip. Conservation Road - Barn Tr. to Bridal Veil Falls Rd. Conservation Road - Bridal Veil Rd. to Three Lakes Tr. Conservation Road - Joanna Rd. to Pitch Pine Tr. Conservation Road - Pitch Pine Tr. to Buck Forest Rd. Conservation Road - Shelter Rock Tr. to Barn Tr. Conservation Road - Lake Julia Rd. to Shelter Rock Tr. Conservation Road - Camp Summit Rd. 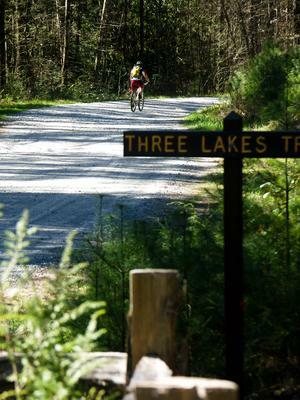 to Lake Julia Rd. Conservation Road - Shortcut Tr. to Camp Summit Rd. Conservation Road - Airstrip to Shortcut Tr. Conservation Road - Shortcut Tr. to Fawn Lake Rd. Conservation Road - Scarlet Oak Tr. to Shortcut Tr. Conservation Road - Fawn Lake Rd. to Scarlet Oak Tr. Conservation Road - Reasonover Creek Tr. to Fawn Lake Rd. Conservation Road - Parking to Reasonover Creek Tr. Conservation Road - Three Lakes Tr. to Joanna Rd.